Earlier this month, Search Engine Land reported that Google had rolled out a significant change to their desktop search results. After a long-running test (5+ years), Google has decided to remove the paid ads from the right sidebar. There are a couple exceptions, Google Product Listing Ads (PLAs) and Knowledge Graphs will still be served on the right sidebar. Google will display 3 paid ads for most search queries, and 4 paid ads for “highly commerical queries”. This change was made to help improve the user experience on Google Search, but it has created some confusion and sparked questions from advetisers. 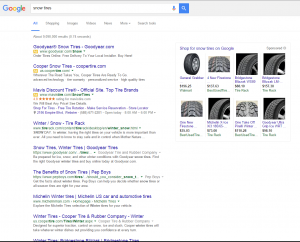 Google search result – 1 to 4 paid ads above page fold. Diversify your online marketing strategy: Advertisers that are relying on Pay Per Click (PPC) to drive visits to their sites, may find it more difficult and possibly more expensive to do business online. With the removal of the right side bar ads, there are less paid ad slots up for grabs. Search Engine Optimization (SEO) is an important tactic and probably became even more vital with this news (less competition with paid ads on top of page should influence more clicks on organic results). Social Media, Remarketing, and Display Ads are other tactics to help diversify your marketing approach. Average positioning: Some advertisers targeted positions 4-6 before this change to achieve optimal ROI, which positioned their ads above page fold on the right sidebar. Now, those same positions will likely get you below the Organic results at the bottom of the page (not exactly prime ad space). We have also noticed a portion of search results with only 1 paid ad being “featured ” above the page fold, so its probably a solid strategy to bid aggressively on your high profit terms to ensure a healthy impression share (for the majority of keywords, a “wait and see” bidding stategy is probaby best). Click costs: Simple supply & demand may take over due to less ad slots in each auction. Pure speculation, but less ad positions, and more advertisers pushing for those top 3-4 positions (to avoid bottom of page “wasteland”) may drive up cost per click (CPCs). It’s also possible that fewer ads on the page will boost click through rates (CTR’s), which will help keep click costs steady. Google tested this format extensively before the rollout and must have been satisfied with the data. Will see how this shakes out with time. 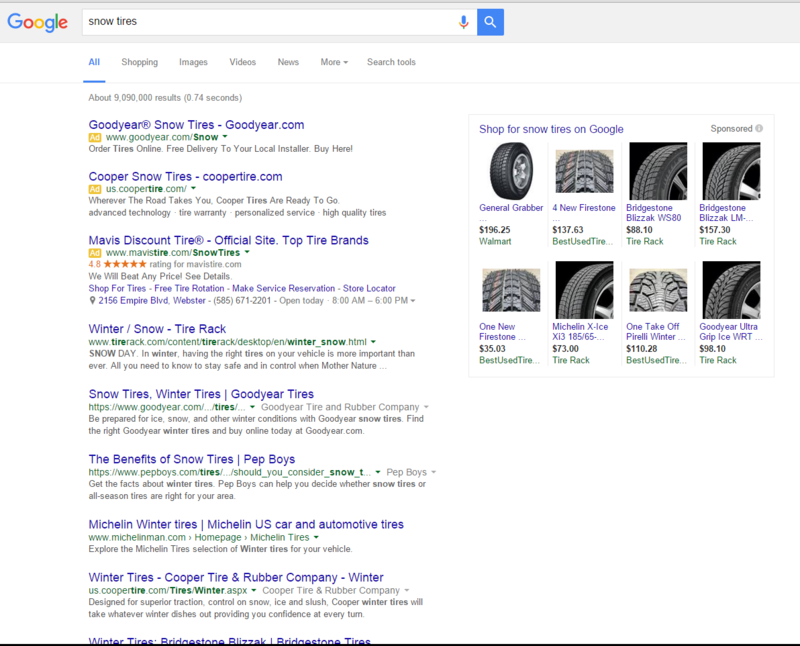 Google Shopping/Product Listing Ads: Google has done a great job of featuring these ads in search results. If you are an online merchant and havent tested these ads, now is a good time. Monitor data: Compare historical data with current data to gain more insight into how this change is affecting your search marketing efforts. Key metrics such as: impression share, clicks, CPC, Top vs Other positioning, etc. Monitor your keyword bids and positions, but dont immediately bump bids on all keywords. As with any industry news, overreaction is unecessary. Last year, Google introduced a mobile friendly algorithm and some feared their search rankings would take a big hit. Some were calling for “Mobilegeddon”. We all know that the search ranking impact was much less dramatic to majority of advertisers, and the sky wasn’t falling. Lots of moving parts, so it will take some time to see the full impact of this change.